CycleVentoux is based in Séguret, France and Barnard, Vermont. 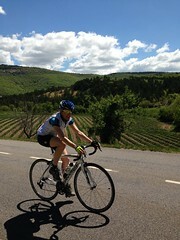 We help arrange logistics for guests traveling to Provence for their cycling vacations at our property there. We are happy to help with arranging luggage and bike transport to make your flight and travel easier and less of a challenge. We keep current with the airlines’ ever-changing rules and regulations. We can help you with other aspects of your trip, such as very reasonable hotels we love, restaurants not to miss, and the best deals on car rentals and how to use your credit card’s built-in insurance to save money. Not to mention tricks on how to set up your iPhone so you don’t arrive home to an astronomical bill. In France we operate as EURL CycleBarroux. It is a fully licensed and insured French corporation for cycle tourism and hospitality. In addition to knowing the area intimately, we have many friends and resources to draw on. If you need medical attention, we are in close contact with Dr. Bouchet and his staff at the Carpentras hospital, a 10-minute drive from the house. Also in the neighborhood are a dentist, ophthalmologist, seamstress, dry cleaners (laundry is on us at the house), dispensing optician, pharmacist, and a computer store for that forgotten USB cable—all well-known to us and friendly and helpful. High-speed Internet is available at the house. We are happy to help with travel arrangements once you’re with us and can help guide you around some of the challenges of traveling in a foreign country. Please do not hesitate to send me an email with any questions you may have. Wow! Holy great trips in the making. I would go without my bike so not to slow you but to enjoy your magnificent cuisine.